When engineers at MKS Instruments in Andover, Mass. decided to build the world's smallest leak detector, they knew that coming up with the right turbopump was going to be a major part of the job. They wanted their to make a truly portable instrument. It would have to be compact enough and light enough so one person could easily pick it up an carry it to a new location. "In the past," says Wayne Cole, Product Manager in the Advanced Technology Group at MKS, "a vacuum technician on a field-service call, for example, would have to scout around to find a leak detector that he or she could borrow at the customer's facility because the units were physically too large and heavy to bring along." 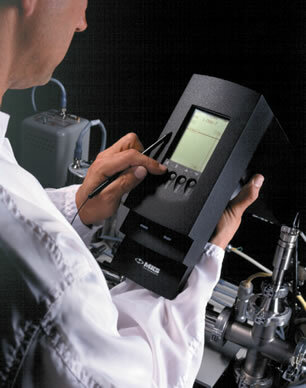 Not that this unit was intended only for vacuum field service applications. MKS's marketing folks felt that such a unit would be extremely helpful in a wide variety of applications in many industries, such as Semiconductor, Air Conditioning Systems, Automotive, Refrigeration Systems, Power Plants, Aerospace, Pharmaceutical, Underground Utilities and Chemical & Petrochemical. In short, they felt that a full-featured, full-capability leak detector weighing less than 20 lb (??? kg) would be popular everywhere leak detectors are used. The problem was that most turbopumps on the market weigh that much or more by themselves. They would have to build their own unit to their own specifications to fit their application. Luckily, they had the design and manufacturing skills to do it. To begin with, they made the volume to be pumped as small as possible. The chose to use an ion-trap MS, which has a single, relatively small vacuum chamber. They next designed their MS chamber to be as small as possible to minimize the gas volume they would have to pump. To save packaging weight and size, they built the MS and its associated vacuum system into a single housing, which needed no external package. In other words, the outside of the housing is the outside of the vacuum system. All of the passages, etc. are machined into it and all of the components are installed inside. Doing away with an external package also did away with the need to carry heat generated in the system away through the external package and away from the internal components. The housing is effectively one big heat sink. The finished system, shown in Sidebar Fig. A, ended up weighing approximately 15 lb (6.8 kg) and being less than fifteen inches (40 cm) on its longest dimension.